The grass is getting greener on the other side of the harbour. Luxury design hotel The Mira just celebrated its first birthday while iSquare in Tsim Sha Tsui opened its doors in June, following on from the opening of the nearby K11 Art Mall in December. Still under construction, The One complex is partially open for business and offers similar entertainment options to iSquare. Cinema? Check. Endless shopping opportunities? Check. Drinks with a view? Naturally. So, let the games begin. If iSquare’s got Eyebar, then The One’s shining beacon is the aptly named Cocky Bar. First impressions of Cocky’s interior are nothing to write home about. A smattering of mismatched furniture – low tables and sofas offer limited seating – is accompanied by brash, plastic lighting giving the space a TST-style vibe that doesn’t compare to its aesthetic superiors across the water. We have a feeling that Cocky wasn’t named for its underwhelming interior but what is found past its expansive windows: a spectacular, breathtaking view to be enjoyed on its wrap-around balcony. Situated on the 18th floor, the low-level buildings that surround The One’s south and west sides (including a unique bird’s eye perspective over Kowloon Park) allow for an open and nearly unobstructed view of Hong Kong’s stunning skyline. The balcony space is generous, fitted with sofa seating along the edge which makes for an ideal setting for al fresco drinking. Now the only thing missing is a fine martini in hand. Our beverage for the night was a selection from their signature martinis: the mint chocolate ($80). The drink was elegantly presented, garnished with a maraschino cherry and sprig of mint. We braced ourselves for a strong, alcoholic punch upon first sip but were pleasantly surprised by a delectable mouthful of Belvedere vodka, crème de menthe and crème de cacao – all flavours present in just the right balance. It was a perfect execution, and one we highly recommend. Disappointingly the bar manager’s attitude was a little too closely in line with the bar’s name itself, as we had to insist that the terrace, still wet from the afternoon’s rain, didn’t bother us. A short, near-argument ensued in which we agreed to stand around the wet tables and chairs as the limited seating inside was already occupied or reserved. 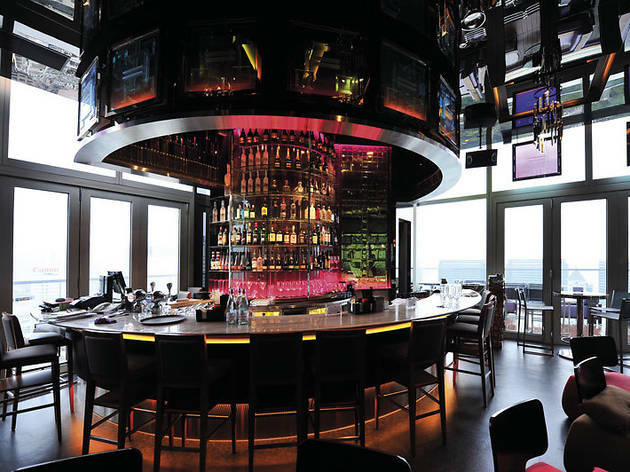 Like Sevva and Aqua Spirit, once word spreads that this decent venue has a view to die for, Cocky Bar may soon find itself on the list of places to impress a date or to take visiting friends or relatives. Just don’t forget our advice and call ahead to avoid knocking heads with the management. 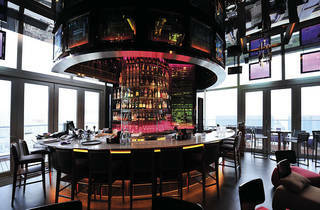 18/F, The One, 100 Nathan Rd, Tsim Sha Tsui, 2724 6388; www.cockybar.com.